Erica Cirino specializes in the problems that plastics in ocean ecosystems cause for birds. Photo by Steven Ferneding. Thursday, May 16, 7 p.m.
Tickets are $10 for Connecticut Audubon members, and $15 for non-members. We are also offering a special $5 student rate! Like modern humans, today’s birds come into contact with plastic on a near-daily basis: They see it, they build with it, they eat it, they feed it to their young. This is especially true of birds living in the plastic-strewn oceans: more than 90 percent of the world’s seabirds having consumed plastic at some point in their lives. All this plastic has come at an enormous cost to birds’ survival on Earth. You’ll learn about the threats plastic poses to avian wildlife and what you can do to help. Erica Cirino is a science writer and artist who explores the human connection to nature –wild creatures in particular. Her stories appear in Scientific American, VICE, Ars Technica, Audubon, The Atlantic, New Scientist, Hakai Magazine, Oceans Deeply, Proto and other popular science publications. In 2016 she wrote about Connecticut Audubon’s Osprey Nation program for Audubon. As an artist, Erica possesses a strong command of various disciplines. She is an award-winning photographer and mixed-media artist who combines her artistic finesse with her knowledge of wildlife physiology and ecology to create striking, thoughtful works focused on wildlife and environmental subjects. 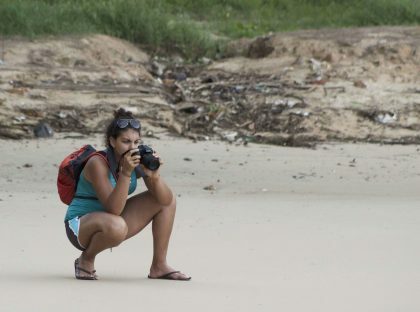 Currently, Erica is focused on covering stories about the global plastic pollution crisis—from documenting plastic in different ecosystems, to investigating the latest science measuring the extent of the issue, to new solutions that could prevent further ecological destruction and harm to wildlife. Erica is a guest researcher studying plastic pollution at Roskilde University in Denmark, helping uncover new information about plastic pollution in the natural environment. She has bachelor’s and master’s degrees from Stony Brook University, and is a “Kalpana Chawla Launchpad” Fellow at the Safina Center in Setauket. One of her major creative inspirations is her role as a licensed wildlife rehabber who has spent several years in the clinical setting. Through her writing, art and wildlife rehabilitation work, Erica hopes to foster human thought, conversation and, perhaps, admiration for the natural world. Connecticut Audubon’s Migration Madness and 2019 Birdathon are scheduled for May 17-19. We have bird walks, programs, lectures, and lots more planned throughout the state.